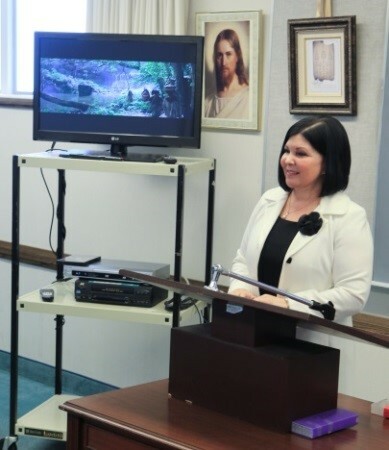 Using videos and pictures in the classroom can enhance any gospel lesson. It can bring a spiritual tone that leaves memorable and lasting impressions. The LDS Media Library on LDS.org offers many resources for teaching, learning, and sharing gospel media. You can also find instructions in the media library on how to access and use technology. If you have been reluctant to use media when you teach because you fear technical difficulties, the following suggestions may help you avoid problems. First, download the media file at home and store it on a laptop, tablet, smartphone, or USB drive. Don’t try to access a video or picture in the classroom using the Internet. If you do, the video may pause, buffer, or even stop. Similarly, if you queue up a video online and press pause (expecting to resume at some point in your lesson), the browser connection will likely time out or freeze before you are ready to resume. Don’t try to open an attachment or a link in an email message because you would be relying on a remote server connection with unknown variables. Copy or “burn” the file to a DVD+RW disk, and use a DVD player connected to the TV at the meetinghouse. Copy the media file to a portable USB drive and plug it into the USB port on a Roku or WD [Western Digital] Internet TV in the meetinghouse. WD TVs support many media formats. USB drives are portable and inexpensive. Upload the file into your iTunes account and sync it with your iOS device. Use your iOS device with Airplay to mirror from your mobile screen using an Apple TV connected to the digital TV at the meetinghouse. The wireless connection with Airplay uses its own network and bypasses potential Internet problems. Download a file directly to your Android tablet or smartphone that is “Miracast” enabled and “cast” or mirror your screen from an installed media player using an Internet TV that supports Miracast. As an alternative, use a compatible adapter cable to connect the Android device directly to the HDMI port on the meetinghouse TV. There are many versions of Android, so test it for compatibility. Connect a laptop directly to a digital TV at the meetinghouse with an HDMI cable. Use the remote control to select the correct HDMI input port to see your laptop display mirrored to the TV screen. If you are using older equipment, you may need a VGA/HDMI adapter with the cable. Use an HDMI cable to connect to a video projector. Test it to make sure the screen resolution on the laptop is compatible with the projector resolution. Set the laptop to mirror the screen to the projector. For additional help, read “How to Show Videos without an Internet Connection” or consult your ward or stake technology specialist. This article was adapted from the article “Create Memorable Impressions with the Media Library” on tech.lds.org.